Mathews sets the bar higher than ever with its new-for-2019 VERTIX. 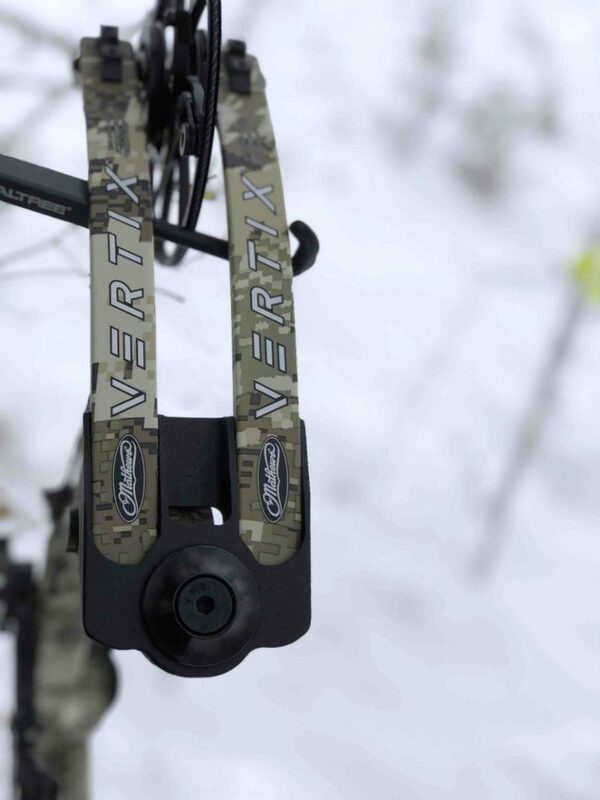 The new 30-inch Mathews VERTIX (above) is 2 inches longer than the TRIAX. 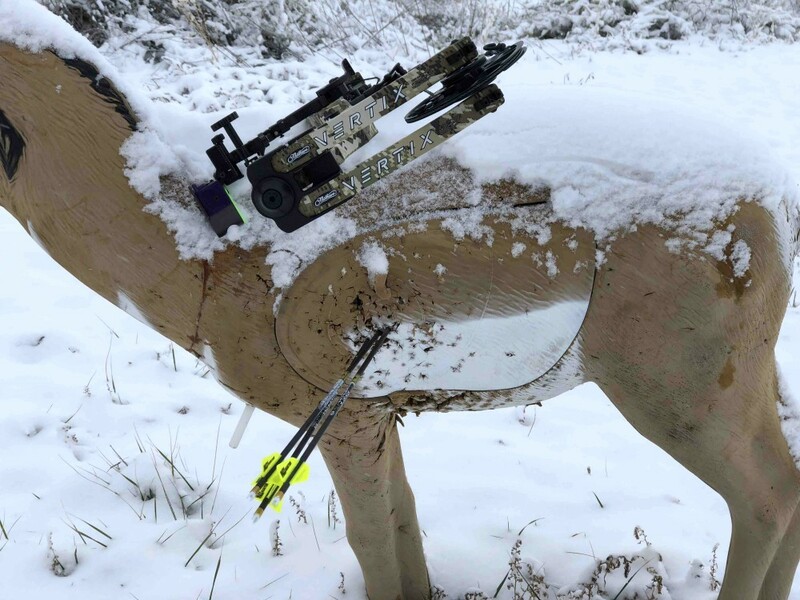 In 2018, I noted that the Mathews TRIAX was the quietest and most vibration-free bow I’d shot to date. That’s just simple truth. Over the years I’ve melted my hand around many a Mathews riser, and the TRIAX, for me, was simply the pinnacle of this fabled bow maker’s crop of vertical rigs. With the TRIAX measuring just 28 inches between the axles, I found it to be compact and maneuverable. (I hunted with the TRIAX a lot this past year.) 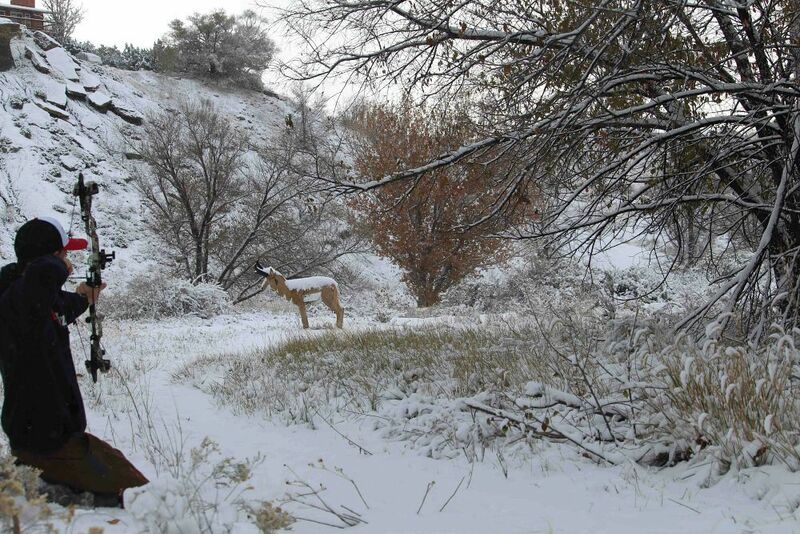 It answered the ground blind, spot-and-stalk and treestand calls with ease. The bow had plenty of speed, and though its brace height measured only 6 inches, I found it to be forgiving and accurate. The Crosscentric Cam system was smooth as silk, yet as powerful as a locomotive. And I simply can’t say enough about Mathews’ innovative 3D Damping technology. My only fuss with the bow, and it was a small one, was the axle-to-axle length. As I stated earlier, I hunted with the bow a lot. While I did make good on a 56-yard shot with the TRIAX, I just really struggled to be deadly accurate at longer ranges. Honestly, it probably wasn’t the bow. I just prefer a bow that boasts an axle-to-axle length between 30 and 34 inches. I couldn’t have been more thrilled when I tore into the cardboard rectangle containing my 2019 Mathews VERTIX. At first glance it looked like a TRIAX — only a TRIAX on steroids — and even without reading the spec sheet, I could instantly see that the bow was longer. Further inspection and research confirmed it was longer, 2 inches to be exact. And when I wrapped my hand around the new-for-2019 Engage Grip, my love affair with this stylish new rig only grew. I get chastised a lot when I write about bows because I put so much focus on the grip, but the way I see it is the grip is my only contact point with the bow, so it needs to be perfect. This grip is. It’s skinny, flat-backed and promises consistent hand placement. Oh, and its ergonomic design feels incredible. Typically, I wrap my bow grips with tennis racquet tape. I do this because the tape provides a solid, repeatable grip, and it reduces slipping when hands are sweaty or wet. There will be no need to wrap this grip. You will just have to handle the bow to see what I mean. 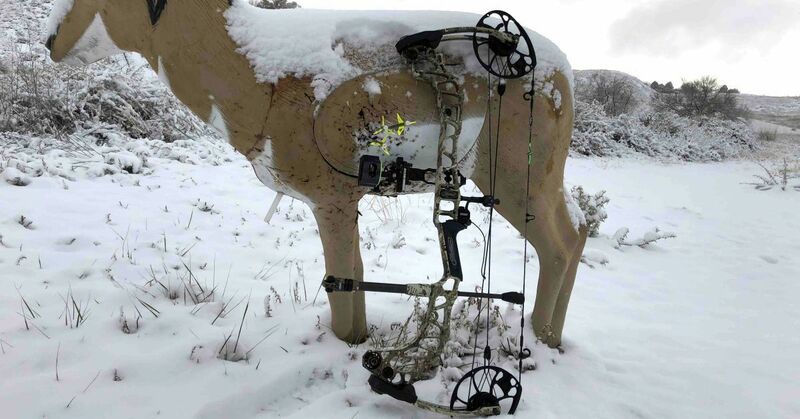 The author tests the new Mathews VERTIX on his cold and snowy home archery range. The draw is as smooth, if not smoother (if that’s possible), than its predecessor, and transition to letoff is not at all abrupt. The draw stops located on the Crosscentric Cams contact the bows inner cable giving the bow a firm, but not too firm back wall. At full draw the bow holds like a rock. It is balanced and steady. For me, those extra 2 inches made all the difference in the world. At the shot this bow is insanely quiet. It’s just crazy. I mean there’s quiet and then there’s Mathews quiet. There is zero hand vibration. The shot is just gone. I could write about this over and over, but you really need to shoot the bow to fully grasp its hushed and vibration-free nature. As with the TRIAX, you can chalk this uber-hushed nature up to the rig’s 3D Dampening Technology. Another sure-to-be-admired feature is the addition of SwitchWeight Technology. This new technology allows the shooter to change not only peak draw length, but also draw weight in 5-pound increments via the cam modules. This means no changing limbs. Available in 60-, 65-, 70- and 75-pound peak weights, each set of mods are programmed to ensure a smooth draw cycle. Mods for the VERTIX are available in 80- and 85-percent letoff options. 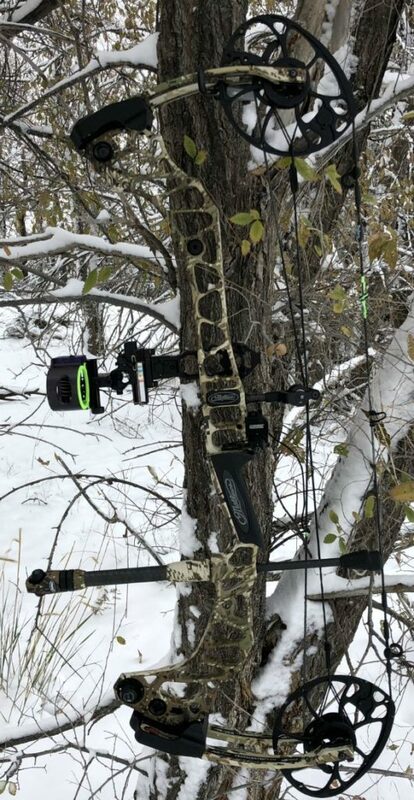 As you can see from these photos, I tested the new Mathews VERTIX on my wintery backyard range, but I also put it through the paces at my local archery shop. Check out the video below to see it in action. In short, Mathews does it again. The VERTIX and I are going to become very good friends in the coming months. Let me know your thoughts after you test drive the bow. Drop me a line at jace.bauserman@grandviewoutdoors.com.